Born in the 1970s in the African American, Afro-Carribean and Latino communities of the Bronx, Hip Hop culture includes DJing, breakdancing, graffiti writing and rapping. According to Johnny Otis, rhythm and blues musician and teacher, in 1975, Mayor Abe Beame was faced with New York City going bankrupt. His choices were few as neither the federal or state governments would come to his aid. So, to solve his problem he fired over 19,000 city workers, and 15,000 of those workers were teachers responsible for instruction in the humanities: literature, art and music. Suddenly a generation of children had no access to instruments and formal music instruction. But ever resilient, these communities looked inward, drew upon their cultural heritage and created a new musical genre “rap,” one of the pillars of hip hop culture, using all that was available to them: language and percussion. The human spirit creates no matter how stripped bare. During the Great Depression, Franklin Roosevelt’s New Deal Works Progress Administration invested in creating jobs across a wide spectrum including the arts and humanities. These became the Federal Art Project, the Federal Music Project, the Federal Theater Project and the Federal Writer’s Project. There was also the Historic Records Survey which employed archivists to identify, collect and conserve historic records throughout the United States. Rand Jimerson writes in the introduction to his recently published book Archives Power: Memory, Accountability, and Social Justice “Archivists [can] contribute to a richer human experience of understanding and compassion. They can help protect the rights of citizens, and to hold public figures in government and business accountable for their actions. Archivists provide resources for people to examine the past, to understand themselves in relation to others, and to deepen their appreciation of people with different backgrounds and perspectives. This is the essence of our common humanity.” Archives and teaching in the humanities are crucial to the formation of citizens able to participate fully in our democracy. In February 2009, Congress passed and President Obama signed into law the American Recovery and Reinvestment Act ARRA which included stimulus funding making investments in infrastructure such as transportation, public schools, college financial aid, renewable energy programs, healthcare and homeland security. Conspicuously absent is direct funding for teaching and research in the arts and humanities, nor for libraries and archives. In his public high school rhetoric class Marcus Eure provides students with critical thinking skills as they study issues about civic morality. Eure believes “every marriage, every job, every parent-teacher meeting hinges in some way on the ability to understand and empathize with others, to challenge one’s beliefs, to strive for reason and clarity. “ The time is now to invest and provide federal stimulus packages in our arts, humanities, libraries and archives. It is our duty and obligation to the future, to build citizens to grapple with the challenges of today. There are two holidays that serve as book ends for my mother’s life: the 4th of July marks her death and Labor day marks her birth. This year – 2009 – marks the 20th anniversary of her passing and would have been her 92nd birthday were she still with us. My mother was an energetic woman hugely impacting my life; it wasn’t always easy, but I know and love the gifts she gave me. She loved making music and creating things. Growing up, there was always some kind of project in the works be it making candles (and spray painting them gold for whatever reason), sewing clothes for me and my sister, or preparing for her teaching job or her girl scout troop. She had so much energy and intelligence and she was driven to do something helpful for others. When I was very young, my mom worked as an occupational therapist. One of her patients was a young man with polio confined to an iron lung. I remember that he painted the most wonderful paintings using only the movements he could make with his big toe. My mother had built a splint for that big toe enabled to cradle a paint brush and she spent hours with him making sure it fit correctly and gave him the support he needed to do his art. From my mother I learned that a person could do anything with a little help and kindness, and beautiful artwork flows from everyone. Unfortunately, the last years of my mother’s life were spent in nursing facilities and hospitals. Our family was fortunate, because the government’s Medicare provision and my father’s health insurance covered those expenses. During the last few weeks of her life, I visited my mom in the hospital and I tried to capture those moments in watercolor. Robert Henri wrote in his book Art Spirit “the beauty of the lines of the drawing rest in the fact that you do not realize them as lines, but are only conscious of what they state of the living person…you have been let into that life.” It was important to paint her, so that I would never forget her pain. Over the years I have returned to those paintings to remember my mother and think about the good things she did for others. I share one with you now to serve as a call to action. This is our time we can make a difference and help others. In the middle of August 2009, the group Remote Area Medical provided free health care services to some 10,000 residents of Los Angeles for eight days providing the uninsured with routine services like eye and dental exams, mammograms and access to special treatments like kidney dialysis. There is a crying need for healthcare reform in this country. We need to find the right model so that no one is without healthcare in our country. The latest recession figures indicate there are 40 million Americans living in poverty and they cannot afford healthcare. T. R. Reid’s book The Healing of America: A Global Quest for Better, Cheaper, and Fairer Health Care describes four basic models of health care at work in the world: Britain’s Beveridge Model where health care is provided and financed by the government; Germany and France’s Bismark Model where private insurance funds — financed by employers and employees — cover everyone and are government regulated to keep costs low; Canada’s National Health Insurance model which uses private-sector providers financed by government insurance plans into which every citizen pays; and lastly the “out-of-pocket” model most found in undeveloped nations where you get what you can pay for. We can do better than the last model. Wednesday night, President Obama laid out his vision of healthcare reform stating “if you’re one of the tens of millions of Americans who don’t currently have health insurance, the second part of this plan will finally offer you quality, affordable choices. If you lose your job or change your job, you will be able to get coverage.” He went onto say we can help people in need and we can solve this big problem. When I remember my mom, I think of someone who was always trying to do something useful to help someone in need. Like my mother, everyone deserves access to healthcare through every stage of their life. Now it’s our generation’s turn to help others. Lets bring about healthcare reform and shape the future by our actions. On Labor Day I kayaked on Tomales Bay. 2PM and it was high tide when I launched near the town of Marshall and the wind was dancing across the water leaving whitecaps in its wake. It was the first time I would be taking my new single kayak on the water. Wave and I have safely captained a two-person kayack on many trips on Tomales Bay where the center of gravity is low and the craft moves very deliberately through water. In my watercolors, I’ve documented kayackers in singles paddling across this water and now it would be my turn. Wave ably helped me launch the craft, and just after my paddle cut through the water, I heard a voice from the shore asking if I had a plan should I capsize out on the Bay. Well, the truth was, no, I didn’t have a plan. I didn’t think I needed a plan. I felt I had the experience to handle any situation that might come up. I just wanted to get out and enjoy the last few hours of sunshine on a laborless day. I was eager to feel the joy of moving across the water, and have the wind and spray on my face and see the sun dappling the water. I imagined the feel of my arms working hard to create forward movement against the wind blown waves breaking across the bow. I imagined the moment, when one turns and with the wind at your back, experience the joy of being rocked forward momentarily airborne on the back of a breaking wave. But the voice spoke a truth that suggested listening. One of the staff for onsite operations for Blue Water kayaks on Tomales Bay took a few minutes out of her busy life and reviewed with me how to manage the unimaginable. A little later I was on the water and the wind was strong and the waves presented a fun challenge. I was deeply grateful that a person previously unknown to me spontaneously showed concern, and I was able to hear the truth of the concern, put my eagerness in check and gently accept the gift. 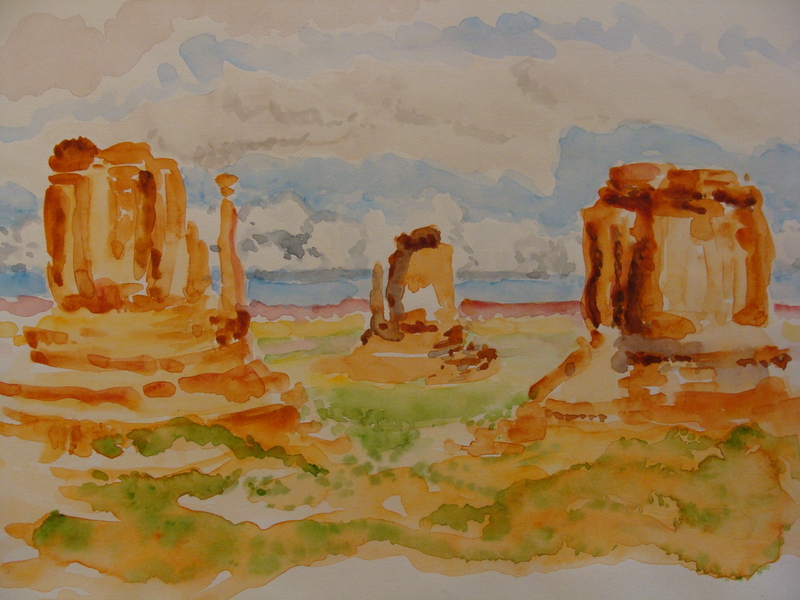 In the late Spring, when we vacationed on the Colorado Plateau, I discovered a book by Patricia Limerick called Desert Passages. Dr. Limerick describes the American encounter with deserts in terms of three attitudes towards nature “as a biological reality in human life…hunger, thirst, injury, disease and death….as an economic resource…a container of treasures awaiting extraction…or as an aesthetic spectacle. “ We affectionately called our trip the archaeology tour as we visited the ruins of the Ancient Pueblo Peoples at Wupatki, Monument Valley, Mesa Verde, and Canyon de Chelly. Wave and I spent many hours at the ruins in quiet meditation while I attempted to capture the essence of these amazing cultural resources on watercolor paper. the beautiful place where we celebrated our 20th anniversary as a couple. So though we’ve only legally been married in California for just over a year, we’ve been a couple for nearly twenty-five wonderful years. Some day in the future, gay marriage will be the norm in our country, and not the exception or blasphemy as some see it today. and a trek to the Pacific Coast Trail where it brushes by Big Bear Lake. Our final adventure of last year was in the San Gabriels hiking Mt. San Antonio (known affectionately as Old Baldy) with my friend Dan. Baldy is some twenty-two miles to the east of Mt. Wilson and Big Tujunga Canyon where the fires continue to burn now in their sixth day. I keep thinking about those mountains — a challenge for the north-south driver — but also a strong range charged with protecting the Los Angeles basin from the harsh temperatures of the Mojave desert and capturing moisture during the winter for the times of drought. I keep thinking about the wildlife and people uprooted by such a massive fire and the lives lost, some heroically and others needlessly. This evening I opened Gary Snyder’s essays Back on the Fire and thumbed to the “Regarding the Smokey the Bear Sutra” and this brief excerpt reads “a handsome smokey-colored brown bear standing on his hind legs showing that he is aroused and watchful, bearing in his right paw the Shovel that digs to the truth beneath appearances….his left paw in the Mudra of Comradely Display indicating that all creatures have the full right to live to their limits…wearing the blue work overalls symbolic of slaves and laborers, the countless men oppressed by a civilization that claims to save but only destroys…wearing the broad-brimmed hat of the West, symbolic of the forces that guard the Wilderness….round-bellied to show his kind nature and that the great Earth has food enough for everyone who loves her and trusts her….” Thank you Smokey.